Professional 17" wide-format 10-color inkjet printer. 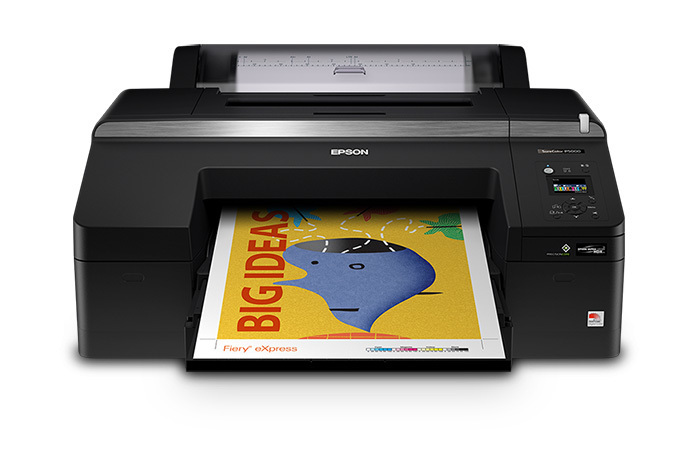 Designed to set the benchmark for professional imaging excellence, the 17" Epson® SureColor P5000 Series offers a refined design for enhanced performance and reliability. Ideal for professional photographic, fine art, graphic design and proofing applications, it features our advanced PrecisionCore® TFP® printhead and Epson Precision Dot screening technologies, developed to work exclusively with 200 mL UltraChrome HDX® pigment ink cartridges. This next-generation 10-color extended-gamut ink set includes higher-density Blacks and delivers up to twice the print permanence than the previous generation1. Plus, get versatile media handling with automatic switching between the high-capacity front paper cassette and the roll media feeder. 2 years from printed production date or 6 months after opened Printer is designed for use with Epson cartridges only, not third-party cartridges or ink. *"
2 99% coverage of PANTONE PLUS FORMULA GUIDE solid-coated palette based on Epson Proofing Paper White Semimatte printed with the Epson Driver at 2880 x 1440 dpi. PANTONE coverage may vary when printed under other conditions. 3 Print times are based upon print engine speeds only. Total throughput depends upon front-end driver/RIP, file size, printing resolution, ink coverage, network speed, etc. Normal is for prints imaged using 1440 x 720 high-speed mode. 4 Ink used in conversion varies considerably based on temperature and other factors. 5 Allowed by printer driver for Mac® and PC. Application, version of application and operating system version may limit maximum length.